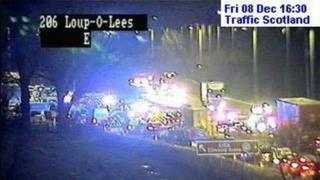 The M8 has now reopened after an HGV crashed into a barrier and toppled over onto its side on the outskirts of Edinburgh. Police said the accident happened just before 15:45 eastbound between Junctions 2 and 3 at Claylands. The driver of the truck was treated by ambulance crews but was not seriously injured. Traffic was heavily affected during rush hour. Traffic Scotland is warning drivers to expect congestion until the backlog of traffic has cleared.